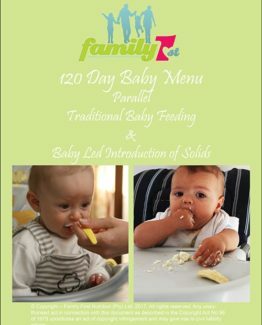 Feeding your baby the right way from the start is very important, as baby feeding forms the basis for eating habits for the rest of your child’s life. Instead of just following advice from friends, parents or grandparents, make sure you have the most up to date information. This is a question all moms ask: When is the right time to start my baby on solids? Can I start solids at 4 months? Should I wait until 6 months before I give my baby food? For the first six months of your baby’s life, all he will need is milk. The best choice is you breastmilk! But before you know, milk is not enough anymore. Buying a pretty bowl and spoon is not the only things to put in place. Your baby need more nutrients like iron, zinc, vitamin A & D, energy and protein. If you teach your baby from day one to love healthy food and to listen to his body, it will help to prevent obesity and other health problems in his childhood years and beyond. Is your baby older than 17 weeks? Did he double his birth weight, weighing at least 6kg? Can he sit upright in a baby chair? Did his extrusion reflex disappear? Will he try to grab food and put it in his mouth? What food should I give to my baby? What food should I not give to my baby? Food that may cause choking, like raw carrots, nuts, whole grapes, etc. Sweet and salty foods: Cake, chocolates, sweets, cold drink, biltong, dried sausages, crisps, etc. When will I know my baby had enough food? How should I give my baby food? Zelda regularly teaches moms and dietitians about baby feeding. Get Zelda to do a talk for you and your friends with babies. Contact us for more information.